Keyboards are for many the entry to piano playing, or for others are a sound creation tool for electronic music and software manipulation. The technology in even the most budget keyboards these days is astounding, and lets everyone have the experience of what's possible no matter if they are a beginner or seasoned professional. 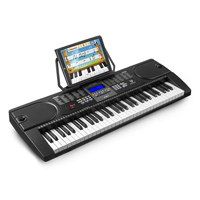 Electromarket have available a wonderful and varied selection of keyboards from Behringer and NJS, and the amazing value instruments of the Max range, with 54 key and full size 61 key units that feature built in speakers and presets. For studio users and software control we have the fantastic Behringer Motor units which have fully motorized faders, midi trigger pads and velocity sensitive keys for ultimate control of your sound creation.